Ever tried to search for a group by name but the part you know is in the middle? Did you think you would be smart and go to the advanced tab then do “blah” contains, hit search and find nothing? Enjoy, if you needed this and found it here please let me a comment, always glad to hear when these things help people out! OMG some things in Powershell are just too confusing to be useful. What if you need to see the last error message again. What if you want to write it into your script to email you when the error happens? The  says give me back the last error. Where  would say to give me back the second to last error message. Set-CsUser : Management object not found for identity “Jerry.Springer@Contoso.com”. Management object not found for identity “Jerry.Springer@Contoso.com”. So what gives right??? Why when you use Write-Host OR even better when you try to email $Error do we get the crappy short error message? Well I don’t have the answer BUT I do have a great work around. As far as I can tell the only thing one needs are the short error message and the line, script, and command. To do this use the code above and then simply use Write-Host or email that new $ErrorString variable. If you need other data follow the info below from how I figured this out. How did I figure this out? Hope that opens your mind to how more complex objects work in Powershell. Did I help? Make Sense? Something Wrong? Put it in the comments. Love to hear when my write-ups help folks out. Get all SMTP Address from Public Folders or Groups or anything in Exchange! 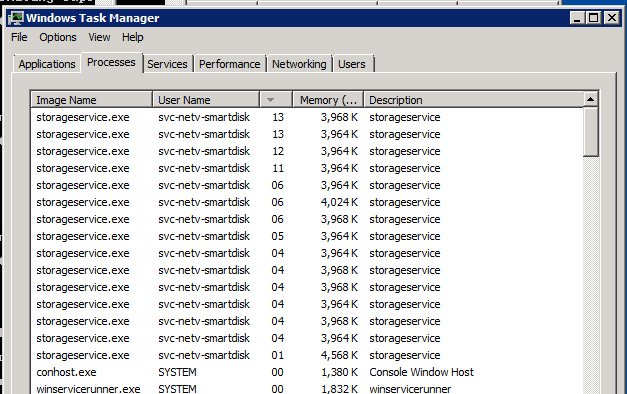 So the Backup Server is going nuts with these storageservice.exe processes consuming 100% of the CPU. It makes it very hard to troubleshoot when the server doesn’t have enough CPU to let the OS run. Below is a script I just created that takes all of them and sets them to only use cores 1 – 4 (basically only allowing it 50% of the total CPU power. # Set Processor Affinity by adding the number together. For cores 1 – 4 its 15 for example. Ah much better, now time to figure out why its going nuts….